Before fast food chains were on every corner of the planet, hungry drivers could stop at a drive-in restaurant for a burger (or a steak dinner) brought to your window by a fresh-faced carhop. Bob’s Big Boy produced an incredible training film for young ladies looking to enter the profession in the late 1940s and the Facebook group Please Flash Lights for Service ‘The Golden Age of Drive In Restaurants’ recently posted it to their page filled with menus and ephemera from these long-lost institutions. The film, Car Hop, is a Kodachrome window into Late Moderne-era Los Angeles, dropping by corner drug stores, swanky hotels, and restaurants including Lawry’s and the Brown Derby. Most of the action takes place at the iconic Bob’s drive-in at 900 E. Colorado in Glendale. The industrial film follows Eve Kennedy, a young stenographer with “too much pep,” as she embarks on a new career serving up Big Boy combos. 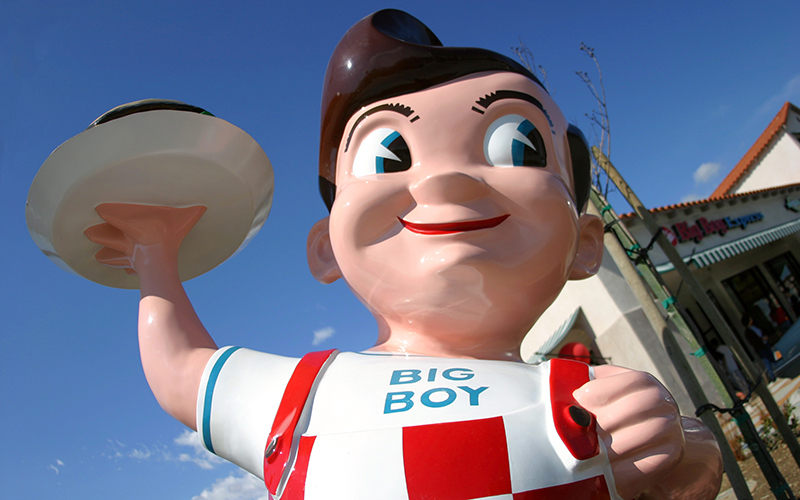 We also meet dapper Bob Wian—the founder of Bob’s Big Boy—in his early 30s, sporting lapels as broad as the wings on as a P-38 and a hyper-Brylcreem pompadour that rivals his fiberglass mascot. Soon after the film was made, Bob’s expanded all over the country and young Wian was elected mayor of Glendale. But what about Eve? According to the film, she is tipped so well that she buys a house, a new Buick, and puts her seven-year-old son in military school. In 1949 Bob hired architect Wayne McAllister to design a glamorous new location in Burbank, which remains open today and has a popular Friday night car show—but no carhops. Bob Wian’s insanely popular creation launched a restaurant empire that Wian sold to Marriott hotels in 1967. After eighty years in business, six stores remain in California. In addition to the landmark Burbank location, you can still enjoy a double decker Big Boy burger in Downey, Northridge, Sun Valley, Norco, and Calimesa. Chris Nichols is City Scholar at Los Angeles magazine. You can follow him on Twitter and Instagram. He likes to help save old buildings. Next articleChef Ryan Ososky of The Church Key Shares His 10 Favorite Dishes in L.A.